The regions around protected areas, which often include or feed into crucial corridors, can be sites of intense human-wildlife conflict. Abrupt boundaries between natural habitat and human-dominated landscapes can facilitate large carnivores attacks on livestock, creating cascades of conflict that result in livelihood losses for people and violent retaliations against carnivores. Understanding where livestock are most vulnerable to carnivores is one of the first steps in mitigating conflict, and can help local stakeholders anticipate and avoid future attacks. A new publication in Ecology and Evolution demonstrates how modeling risk hotspots for tiger depredation on livestock can reveal spatial patterns for guiding conflict management and ultimately inform decisions on corridor placement. 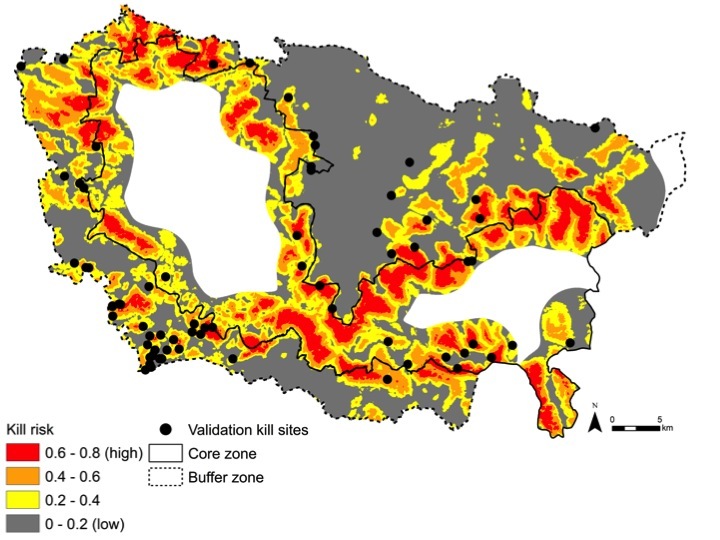 Using a spatial model based on livestock kills and random sites around Kanha Tiger Reserve in central India, the study identified the landscape features associated with tiger attacks and mapped risk hotspots around the park interior. 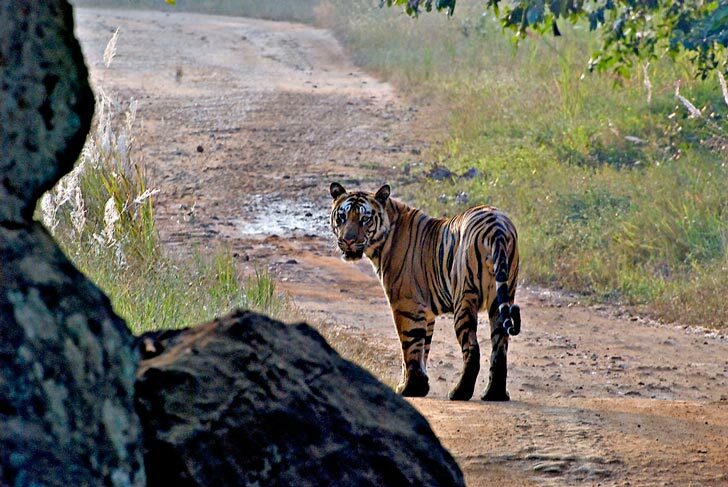 Results showed that tigers tend to kill livestock in dense forests away from roads, villages and open vegetation. High-risk hotspots were concentrated in dense forest patches along the boundary of the park core zone, a restricted area where livestock grazing is illegal yet nonetheless continues. By comparing models generated at different spatial resolutions, and validating models against an independent dataset of kills, the study also concluded that the finest-grain model (20m) was better at predicting attacks than coarser-grain models (100m and 200m), indicating that carnivore decisions about the kill stage of hunting for stalking predators like tigers occurs over a very small area. Since the kill data used to build models were collected through the park’s livestock compensation program, the study illustrates the insights that can be generated from existing conflict data. Such models offer simple yet powerful information about distributions of human-wildlife conflict that may help managers and livestock owners target conflict mitigation efforts, such as selective fencing and reinforced livestock enclosures. This in turn can lead to more effective land use in designating corridors and other areas needing conservation protection. Miller, J. R. B., Y. V. Jhala, J. Jena, and O. J. Schmitz. 2015. Landscape-scale accessibility of livestock to tigers: implications of spatial grain for modeling predation risk to mitigate human-carnivore conflict. Ecology and Evolution. DOI 10.1002/ece3.1440. 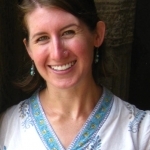 Jennie Miller is a Visiting Scholar in the Department of Ecology and Evolution at Cornell University and a Research Affiliate at the Wildlife Institute of India. She earned her PhD from the Yale School of Forestry & Environmental Studies, where she studied the spatial patterns and human perceptions of tiger and leopard attacks on livestock in India. Her research explores interactions between carnivores and people and develops science-based tools for helping local stakeholders coexist alongside wildlife. For more: http://www.jennie-miller.com.